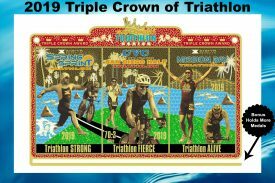 (San Diego, Calif., March 29, 2019) – KOZ Events today announced that it will be offering its 4th Annual SD Tri Series Triple Crown Award. All athletes who compete in the XTERRA WETSUITS Spring Sprint Triathlon, the CVC San Diego Half Triathlon, and the XTERRA WETSUITS Mission Bay Triathlon during the 2019 season will receive the brand-new Triple Crown Award. The three medals from each race come together to form a unique piece of art to hang on the wall. In addition to displaying the three race medals, the award can also hold additional medals. The San Diego Triathlon Series Triple Crown has been gaining popularity among Southern California triathletes and has even gained international acclaim, being featured in the May 2018 Triathlete Magazine Design issue. The first event in the 2019 Triple Crown Series is the XTERRA WETSUITS Spring Sprint Triathlon Festival on May 4th-5th at Mission Bay in San Diego. On Saturday, May 4th, the festival will feature its First Annual SwimRun with a $1500 cash prize purse. The top Male Team, Female Team and Mixed Team will each earn qualifying entries into the SwimRun National Championships taking place in Richmond, Virginia on October 19, 2019. The sprint and international-distance triathlon races on Sunday, May 5th feature a calm bay swim and flat bike and run courses. This year’s XTERRA WETSUITS Spring Sprint will serve as the USAT West Sprint Regional Championship and the USAT West Youth & Junior Regional Championships. The international triathlon will consist of a 1K swim, 31K bike ride, and 10K run while the sprint triathlon will consist of a .25K swim, 10-mile bike ride, and a 5K run. On August 11th, the CVC San Diego Half Triathlon – The Chula Vista Challenge, is the second of the races in the Triple Crown Series. Hosted by KOZ Events, in partnership with Pulse Endurance Sports, the CVC will be a full-day festival designed for the entire family. Each race has been designed to make this event both athlete and family-friendly, and the swim start, transition area, expo, kids’ fun zone, and finish line will all be contained in Bayside Park for optimal spectating opportunities. The CVC will offer a staggering 11 different races including Sprint, International, 70.3 mile, and Youth distance events. The final race in the Triple Crown Series will be held on September 29th at Mission Bay in San Diego. Last year over 1600 athletes competed in the XTERRA WETSUITS Mission Bay Triathlon making it one of the biggest triathlons in San Diego. The event will feature an international-distance triathlon (1000m swim, 38K bike ride, and 9K run) as well as a sprint-distance triathlon (500m swim, 19K bike, and 5K run), a sprint duathlon, a sprint aquabike, a mini-sprint triathlon (ages 11 and up), and an itsy-bitsy event (ages 7-10). The Triple Crown Triathlon Races all benefit Challenged Athletes Foundation – Operation Rebound. The San Diego Triathlon Series is offering 6 USAT Sanctioned Triathlons for 2019. The series events draw competitors from around the country and internationally which brings a high level of competition to San Diego, the birthplace of Triathlon. The distances offered range from the Sprint to the CVC San Diego Half 70.3 Mile Triathlon. Owner Carrie Panek is a USAT Certified Race Director.